I've been getting a few questions about what foot to use for free motion ruler work if you don't have a Janome and have also recieved an email from Jan Olson, the designer of the Fine Line Rulers, indicating she's been getting these sort of questions too. I figure I had better do an in-depth post on free motion feet and the ruler work toe! Above is a fairly poor shot from a previous post reviewing the couching foot that shows the bottom of the convertible FMQ foot set, with the open toe attached. It's the lower foot. Now, this is all fine and dandy if you have a Janome, you say. But what are the options for non-Janome owners? 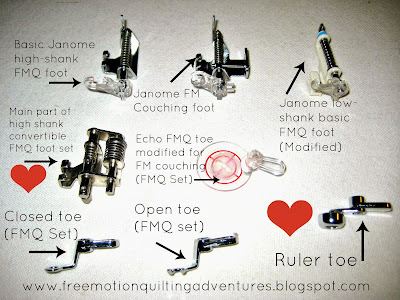 First of all, even if you do have a Janome, but not the ruler foot OR maybe even not the convertible FMQ foot set (and you really should get the FMQ set if you FMQ on a Janome! Awesome foot! ), you can do ruler work on a standard free motion foot. But, it's tricky. I slapped one onto my machine to verify this. These feet hop up and down so the foot doesn't move as smoothly down the ruler. (Above, it is in the down position, and below, the up position while stitching-- presser foot is down, don't confuse that) You can follow the link above to Leah Day's instructions to modify a hopping foot so it doesn't hop. And of course, the toe is much thinner, making it easy for the ruler to slip over the foot and posibly under the needle, which would break the needle. You can raise the foot slightly so it hits the ruler at the middle of the thickness and that can help. Also, since the regular FMQ foot isn't evenly round, for the most even spacing of lines, you need to hold the ruler to one specific spot on the foot. The ruler toe is packaged specifically for the 1600P so some dealers will say it can't be used on other Janome models. It fits perfectly on the high shank convertible FMQ foot set and I have been using it for 2 years, with the blessing of my local Janome dealer. I have yet to verify that the ruler toe fits on the low shank version of the convertible FMQ foot set. I believe it will, but I will let you know for sure soon. [Note: the ruler toe comes packaged with only it and another 'toe' in the package. It is not the set that comes with the convertible foot set for the 1600P] Here's a link to one place you can buy the ruler toe. While I am at the Quilt and Sew Expo in Fredericksburg, VA this Friday and Saturday, I will be checking around to see if there's any other feet out there for ruler work. If you attend, come find me! I will most likely be stitching on the new Gammill Charm with.....a ruler in hand! Hit me up in the comments if you have more questions. I love chit chatting with you. Good Morning. Another informative posting. Thank you for taking the time to pursue this interesting topic. I have a Bernina (low shank) as I mentioned in a previous comment. I have a snap-on adaptor to go from low shank to high shank. I know we can adapt low shank to high shank, but I can't get my head around going from a high shank to a low shank. I found an very informative sewing machine parts website some months ago. I'll try to find web address. Maybe I pinned it. I'll check my Pinterest ......See you in three hours! Well Amy, I found the website I was looking for but it wasn't any help. Although I did find a "too good, not to share" tip at: http://www.futuregirl.com/craft_blog/2008/7/sewing-vinyl.aspx. 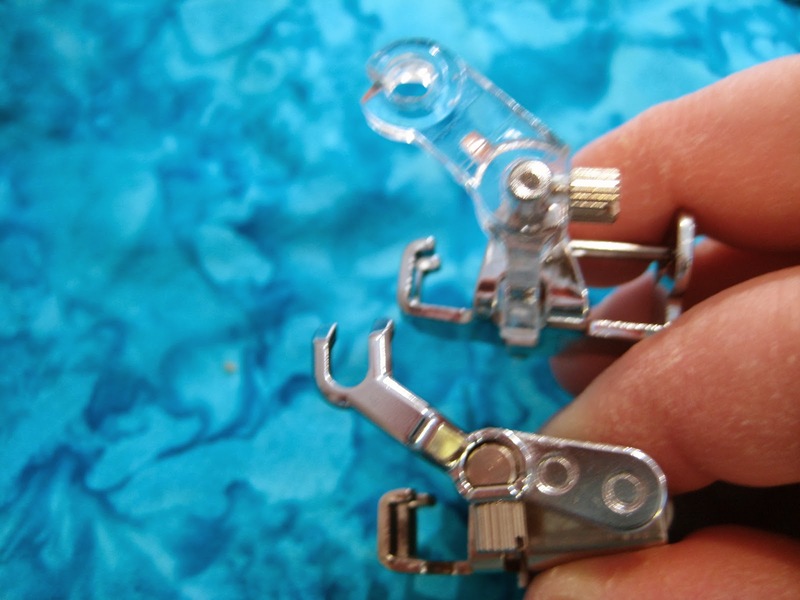 Alice states, "If you've ever tried to sew vinyl or plastic, you've discovered that the metal presser foot on your sewing machine STICKS to it like nobody's business. The solution is simple: just put a piece of tape over the bottom of the presser foot." (Sorry it's not related to ruler work). Wonderful blog I just discovered with lot of intersting tips. I don't know if this foot is available in France and also if I can order internationally these rulers ...I will make search because now I'm hooked ! Thanks Susan! That’s good to know. I am hoping to hear from more folks as they see these posts and try this technique. Thanks for posting this. I have a Bernina and will have to give some of my feet a try with a ruler. I don't have a Janome, but a Juki tl-2010q. I can tell you that I do ruler work using Sharon Schamber's Stipple foot. It's modified, doesn't hop and works just fine around rulers. I almost can't imagine using a hopping foot again. Yes, the hopping style feet drive me batty! I looked your foot up and I see it's shaped like the round, closed toe. Do you find you need to raise it up a bit, so the ruler doesn't slip over it too easily? So glad you have an option that works for you! Yes, I do raise it up and it works really well. Love the foot. Denise, I have the SS stipple foot on a Juki TL-2010 also, but find that sometimes it hangs up on the bulkier seam allowance spots. Can I ask how you raise the foot? My father in law has offer to machine me a ruler toe for my vintage necchi Mira. Can you tell me how tall/thick the toe is and how large in diameter. Does the toe touch the fabric while in use or float a bit? The toe is one half inch in diameter so that the needle is one quarter inch from the edge in any direction. it is approximately one quarter inch thick to rest against the rulers. It does float and is adjustable in height to accommodate various thicknesses of batting and fabric. I quilt with rulers on a JukiTL98e, using a ruler foot modified from the Juki OEM free motion foot by Finishing Touches Studio. I couldn't be happier with this foot. It's perfectly round, 1/2" diameter, with 1/4" raised sides that ride along the edge of longarm rulers. Finishing Touches also sells ruler feet that work with a number of other makes/models of sewing machines (though not Bernina). Highly recommend. I'm just getting into FMQ and FMQ with rulers in particular. I wasn't sure about ordering the Convertible Janome set, plus the ruler foot set for my 15000. I wondered how much I would actually use it - so I experimented a bit. I thought the main thing you want is a foot that doesn't hop but that can be used on the Quilting Straight Stitch 2 setting via the Applications menu of the 15000 - since this is set up to use the non-hopping feet supplied with the machine (that are not particularly good for ruler work). I did think I might be able to use the big circular marked one they specify for zig-zag work - but the because the bottom is curved the ruler kept slipping out of place. However what I did find was that I could use the Embroidery foot - P - for stitching around curves (tested with some jar lids) and the button foot (which does not have a pivot point) for straight line stitching. The fact that you can adjust the height of the foot on the FMQ Straight Stitch 2 means that you can adjust it to suit whatever guide you are using. Sam, I am glad you've ordered the proper parts to get the ruler foot combination. The 15000 is too nice a machine to cobble something together when there's a nice foot available. Especially as you wouldn't want to hit the ruler with your needle and mess up the timing. A regular straight stitch will be the stitch to use for the convertible fmq foot set. I'm not sure which one, just so that the needle falls in the center of the ruler foot. The height is adjusted on the foot itself.